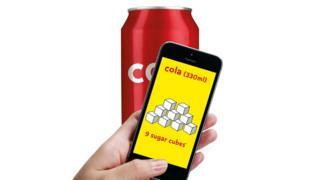 The "sugar smart app", from Public Health England, works by scanning barcodes and revealing total sugar in cubes or grams. That's about 5,500 sugar cubes - more than the weight of an average five-year-old child. It works on more than 75,000 products, offering a quick guide to help parents to assess potential purchases that may harm their children's health. "If there's one thing I'd strongly encourage parents to do, and that's to swap sugary drinks out of their kids' diets for either a low-sugar drink or water or low-fat milk, which would be a really excellent choice." In the UK, we consume over two million tonnes of sugar every year, but we don't always know we're eating it. Extra sugar is added to some savoury foods, like low-fat yoghurt and wholemeal bread, because it makes them taste better. The sugar smart app is free to download from app stores.